Like many, you probably have more than one person using the main bathroom in your home (or perhaps you only have one bathroom for everyone), and are looking for ways for everyone’s things to live harmoniously in a clutter-free environment. This does not have to be difficult and doesn’t need to cost a fortune! Here are 4 ways to add extra space, hide clutter, and allow multiple users to enjoy their bathroom time! There are many options for hiding the shampoos, makeup, and other toiletries your household has. Hideaway storage helps clear up counter space and create a streamlined décor, making the bathroom seem larger. Besides the traditional drawers below your vanity mirror, try adding roll-out drawers below the sink. You can usually stack up two or three drawers, and hide many products in them. Just make sure you don’t have a leaky faucet! Within the shower, above the bath and above the toilet there is usually some empty space between wall studs. This can very easily be cut out and turned into a tiled cubby area complete with a shelf or two, and these little areas are great for towels, bath and shower needs, and even luxury items like candles! 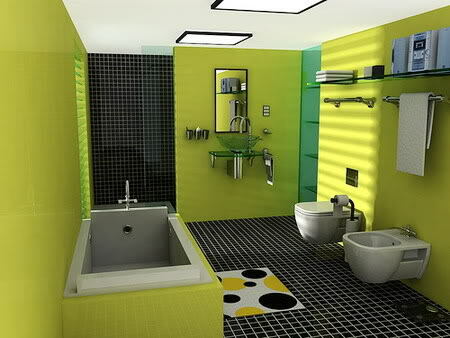 Typical items which hog space in a smaller bathroom include large vanities and toilets. Consider replacing these with a pedestal sink and smaller toilet. Use the options for wall storage to store the items necessary, and keep the floor area open to create a feel of much more space. Finally, if you don’t have many places to add an inlaid shelf (or have used up all of your inlaid shelves), you can tack on single shelves in areas that are typically wasted. The most commonly overlooked areas for a shelf or two is between your bathroom window and the ceiling and in corners of the room.. These are typically just empty space, but adding a shelf means just a bit more storage that is up and out of the way. As always, make sure the shelving options are not intrusive to the functionality or overall design! There are also several design tricks to make a room appear larger than it is, which can help you and other users of your bathroom coexist in peace. Really, it is not about the size of your bathroom, but how you use the space!